Weltering there in the dust and in blood lay all of the suitors. While by the heat of the sun drawn forth is the life from their bodies. Thus were lying in heaps, piled one on the other, the suitors. So lay the suitors, heaped across each other. The Odyssey has traditionally been seen as something of a continuation, or “Part B,” of the Iliad. While the surviving Greek heroes of the Iliad return to their city states from the ten-year war without lengthy detours or wanderings, Odysseus’s journey back to Ithaca takes a decade. 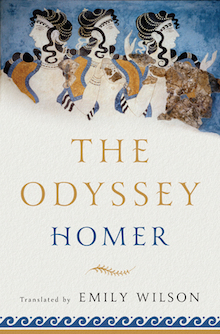 The Iliad’s action is linear and takes place over a few weeks on the plains before Troy, while the Odyssey’s narrative is fascinatingly rich and unpredictable, reversing and moving forward in time and place as Odysseus travels—physically or in his recounted memories—through a real and supernatural bronze-age world. One of the remarkable qualities of Wilson’s translation is to bring the epic’s extraordinary diversity to the fore, making also the everyday moments of this ancient world accessible to us with all its cultural and ethnographic elements. had leather patches to protect from scratches. fixing it firm with pegs and fastenings. so wide Odysseus measured out his raft. and fixed long planks along the ribs to finish. Athena’s clear bright eyes met his. One of the remarkable and very useful aspects of this new Odyssey is Wilson’s thorough introduction. It is both scholarly and readable. In her translator’s note she lays out her theories and methods of translation.